Microsoft Project Peak Units alligns assignment units with peak so the end-user at all times ses the correct load on each task and assignment. 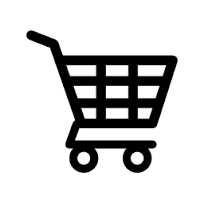 The add-in will automatically recalculate the assignment units, each time there was a change made to the assignment/task, a project is opened, or a project is saved. 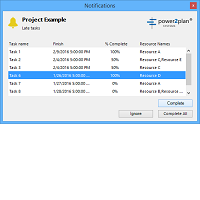 Microsoft Project Notification enables a notification window while opening a project, which displays all the late tasks, together with their assigned resources. The application lets you complete any of these late tasks with a click of a button. 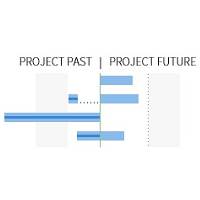 Color Gantt allows the user, to color the Gantt chart by using multiple coloring schemes, to identify different project scenarios. Includes resource coloring, heatmap coloring, overallocated resource coloring, late task coloring and more. The application helps sort out the project past and project future after update so tasks apear correct time frame in the schedule.